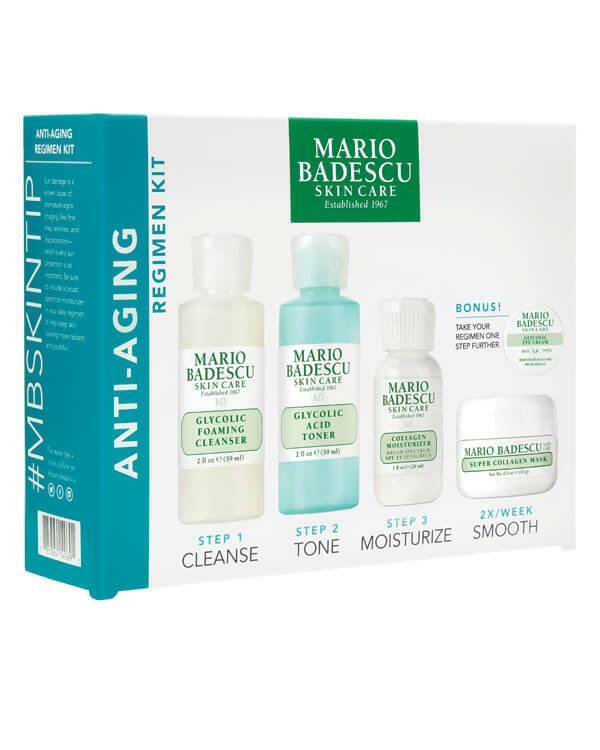 This Anti-Aging Kit from Mario Badescu contains five products that stimulate your youthful appearance! This kit is based on the powers of glycolic acid, aloe vera, grapefruit, chamomile and St. John's Wort extract to reveal a smoother and beautiful skin without feeling dry or greasy. The Anti-Aging Kit from Mario Badescu includes a five-step plan, with a cleanser, a toner, a moisturizer, a mask and a bonus. To clean, use the Glycolic Foaming Cleanser, an effective face wash, a deep cleansing and exfoliation for all skin types. Use this cleanser 1-2 times a week if you have dry skin, 2-3 times a week if you have oily skin. After cleaning, it is important to remove the last bits of makeup and dirt. This Glycolic Acid Toner is specifically for dull skin and suitable for dry or sensitive skin. Featuring the refreshing Aloe Vera, Grapefruit and Glycolic Acid, this toner gently exfoliates en rejuvenates. After the cleaning section, it is important to take care of your face and moisturize. The Collagen Moisturizer is a light moisturizer that helps to keep your skin smooth, firm and hydrated. The Super Collagen Mask, using the powers if collagen, kaolin and oatmeal to nourish and protect your skin. The Super Collagen Mask is the answer to your anti-aging concerns! Hydrate, protect and soften the appearance of fine lines around your eyes with Glycolic Eye Cream. This eye cream is perfect for your evening beauty regimen! Fijn dat dit testpakket bestaat. Als je alles voor het eerst gebruikt zonder te weten of deze wel voor jouw huid geschikt is, dan is het anders toch wel een grote investering. De flesjes zijn klein, maar je doet er echt lang mee, omdat je van alles maar weinig nodig hebt. Als dit pakket op is, dan bestel ik zeker de full size versie. Fijne producten. Denk nog wel even iets langer uit proberen om een definitief oordeel te geven. Door overgang ineens puistjes/kraters/acne. Nooit gehad in mijn jeugd. Hoop met deze producten er een beetje mee te dealen. Huid is wel wat rustiger merk ik al. En goed schoon door de cleanser. I heard lot of good things about Mario Badedcu so I chose anti ageing starter kit. I love the products and I will now order more products from this brand. I can see difference. Love this kit! It was a great way to try the products without committing too much! And as it turns out the products are great, my skin looked and felt better after the first use. I will definitely be buying the full-size of these products when I've finished the mini kit.